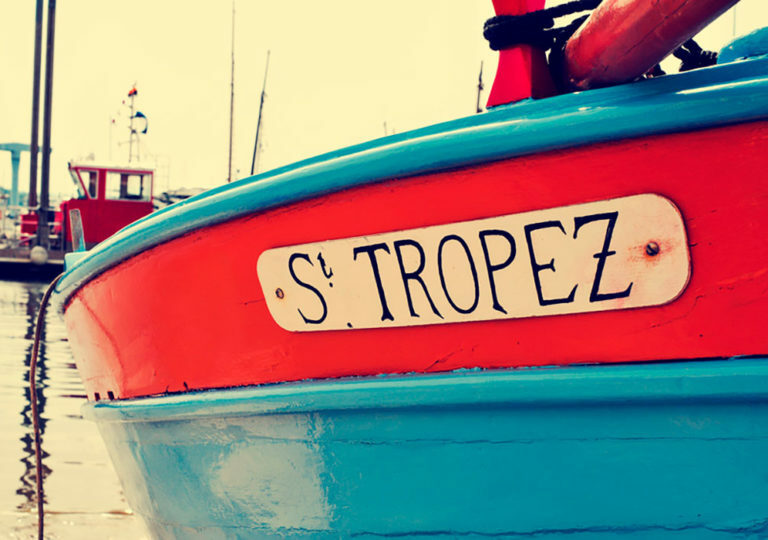 The Gulf of Saint-Tropez conceals little creeks situated on preserved sites where it is nice to bask in the sun. 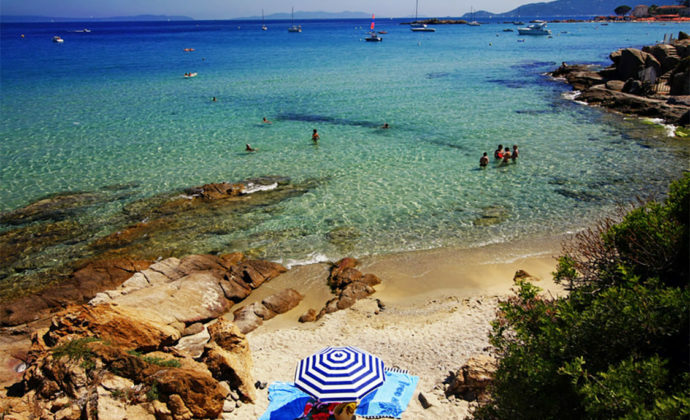 The village of Rayol-Canadel-sur-Mer alone has five fine-sandy beaches. The Pointe du Figuier is only accessible through the Jardin des Méditerranées as this is a protected coastal zone, making it a preserved and exceptional place. 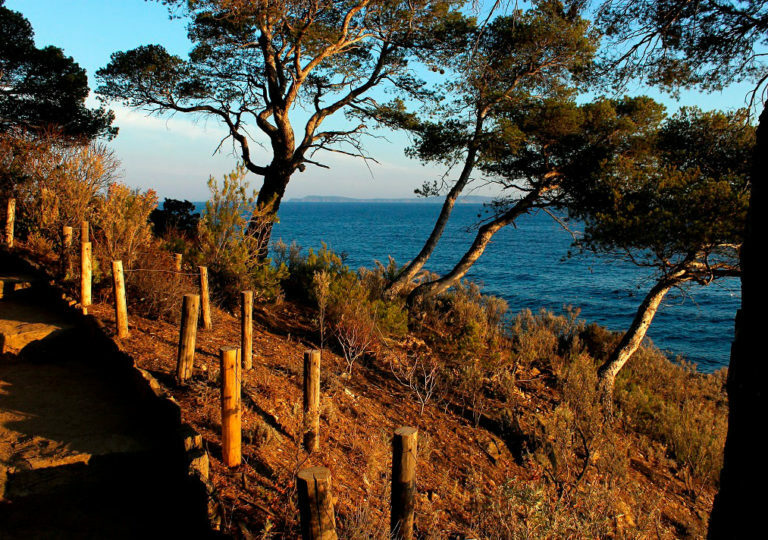 We get there from the Domaine du Rayol by booking their “seaside outings”. Let us not hesitate the least bit, as this experience is without doubt one of Rayol’s most fabulous. From Canadel’s beach, it is worth prolonging the walk on the green track, the old railway line, for just over half a mile to go as far as Pramousquier beach. 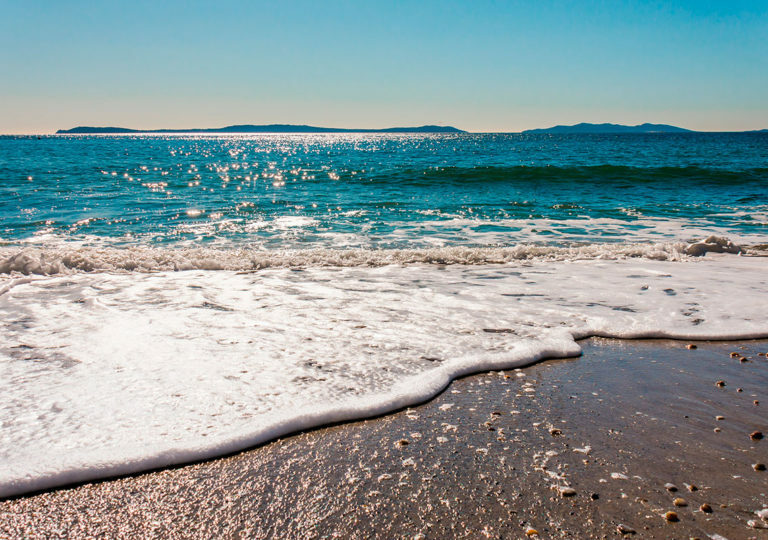 The districts of Rayol and Lavandou share this lovely expanse of sand close to Cap Nègre. 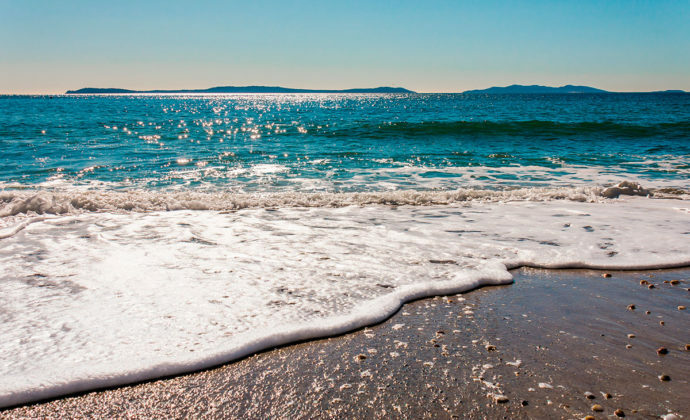 It is nice to bask in the sun while admiring the Or islands off the coast… It is also well liked on account of its orientation which shields it from the high winds on mistral days. We recommend it more outside of the peak season as it can be quite busy. 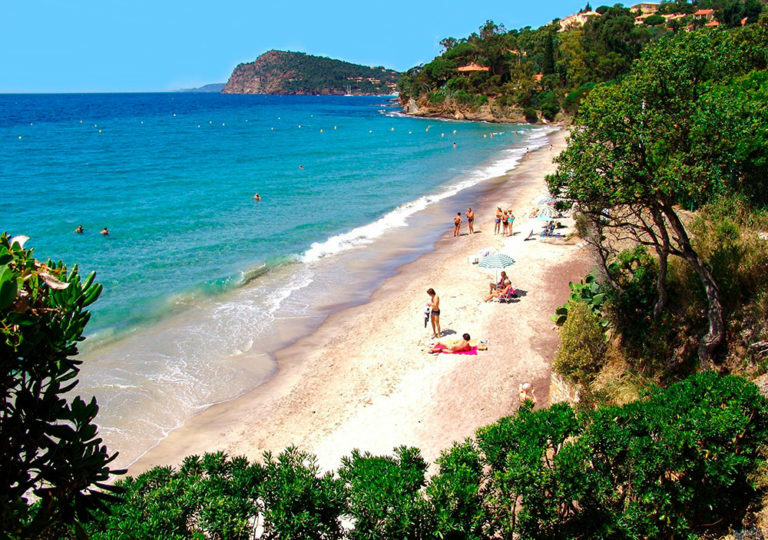 This is one of the Var’s most beautiful beaches and it is only 6 minutes away from La Villa Douce by car. 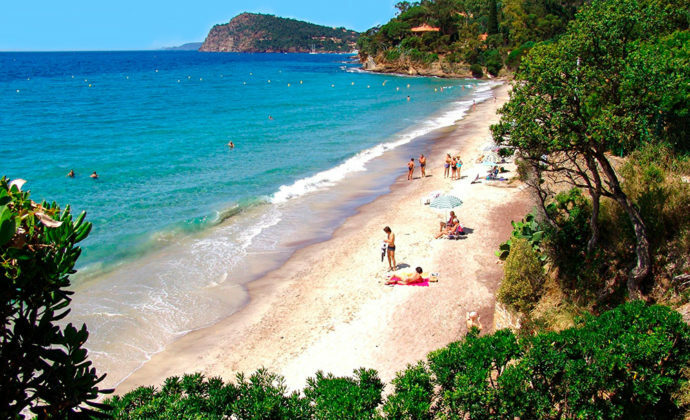 At the foot of the wooded hills, Canadel’s beach is bigger than Rayol’s. Its stretch of sand is also divided into two parts, east and west, by a rocky promontory. Here, the mood is a family one! One does not hesitate to put on their mask and tuba as the sea bed is exceptional. A free car park makes it possible to park nearby. 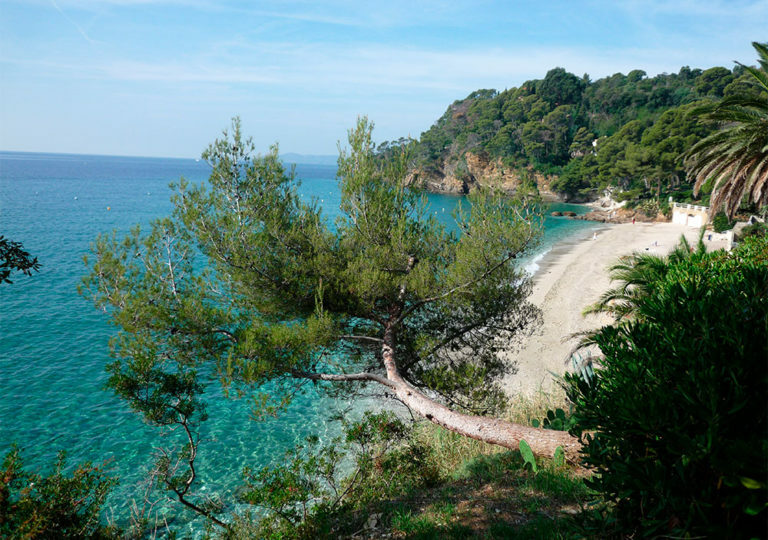 The beach closest to La Villa Douce is Rayol’s, a mere 5 minutes away by car. For added comfort, a regular shuttle bus service operates between the hotel and the beach in peak season. 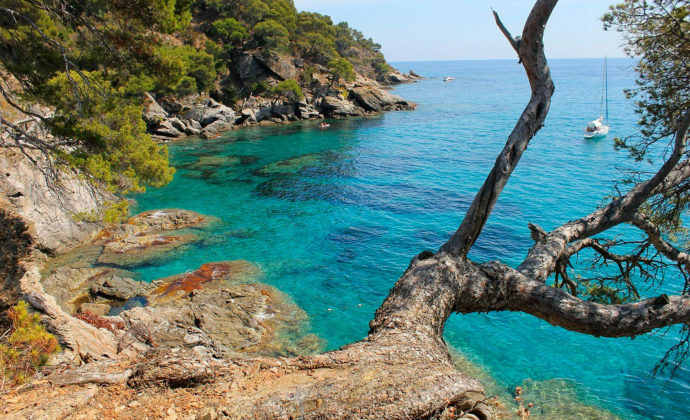 It is also possible to go there on foot via a pleasant trail that descends all the way to the sea and end the walk with a refreshing dive in the sea. Rayol’s beach which is actually made up of two small beaches, is our favourite not only because it is situated in an idyllic setting, but also because it is less busy than its neighbours, even in peak season thanks to the fact that it is hardly visible from the road. Still, remember to reserve your air bed at La Villa Douce’s reception! 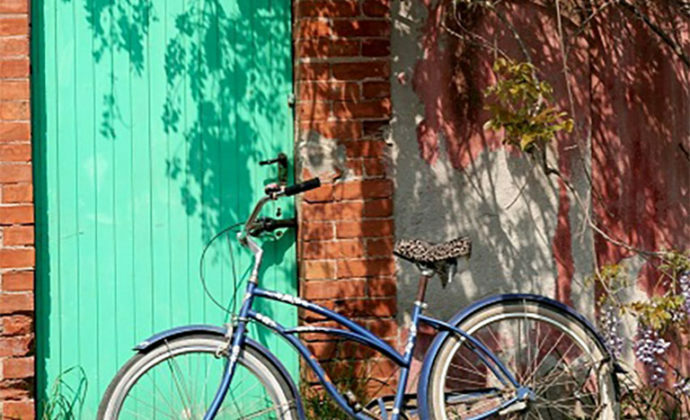 Le Rayol is a Riviera haven of peace, even at the height of summer. 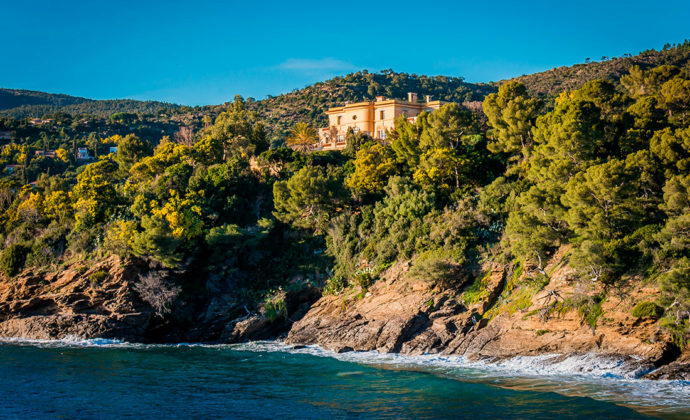 As one walks along the coast roads, one sights sumptuous villas, built during the Années Folles. Our advise for going out wandering: wander on foot. 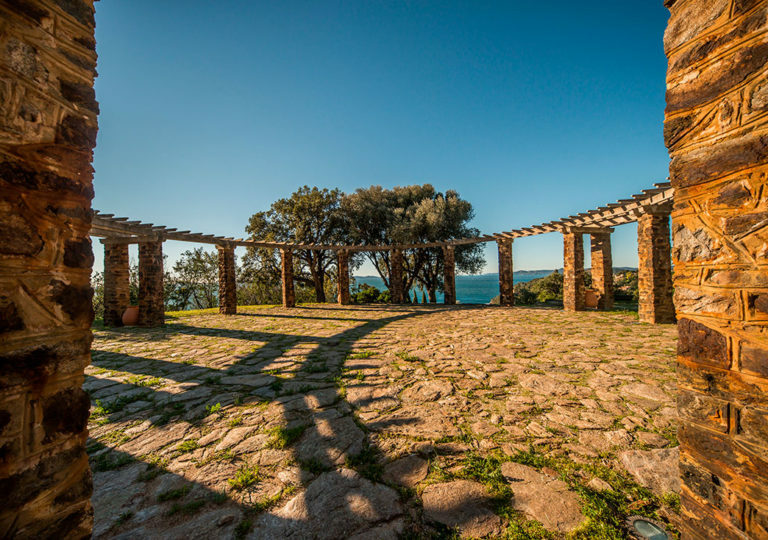 Whilst climbing the monumental staircase, one takes a break at the Patec Pergola to appreciate its architecture and also to enjoy the first wide view of the horizon. It was formerly a threshing floor in the past, the place where harvesters laid down the cut wheat and treaded on it in order to separate the grain from the ear. 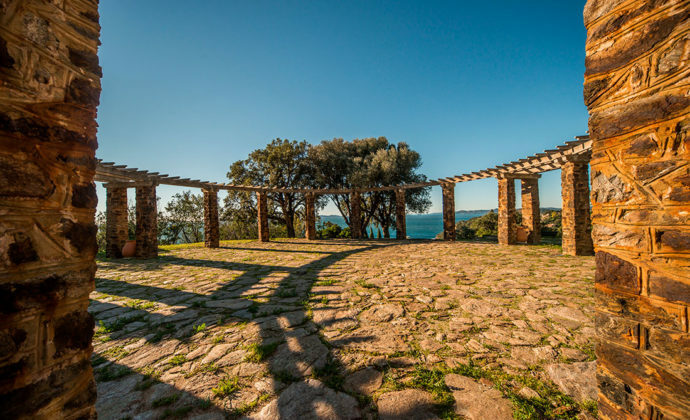 Just like the staircase, this circular pergola is listed on the supplementary inventory of historical monuments. The place being conducive to meetings, important district events are held here on a regular basis. One of the things the village is most proud of is its shale stone monumental staircase, listed on the supplementary inventory of historical monuments. It was originally designed to give residents access to the beaches, at a time when roads had not yet been built. 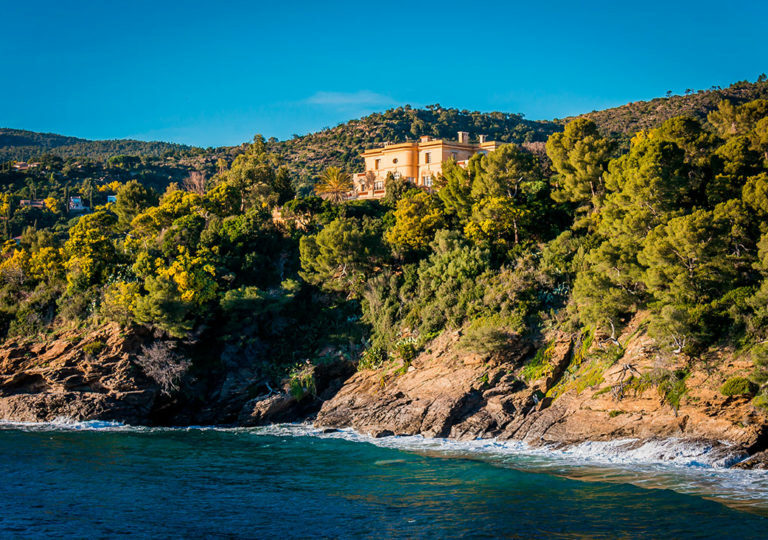 Its architecture is original and climbing it offers a lovely reward: an unrestricted view over the Gulf of Saint Tropez. For this, one has to go up the 780 steps that make their way from the sea up to the village heights and continue as far as the old line, there where the flag attests to the district’s highest point . All along the climb, you are immersed in the 20s Art of Gardening, the age in which the staircase was built. 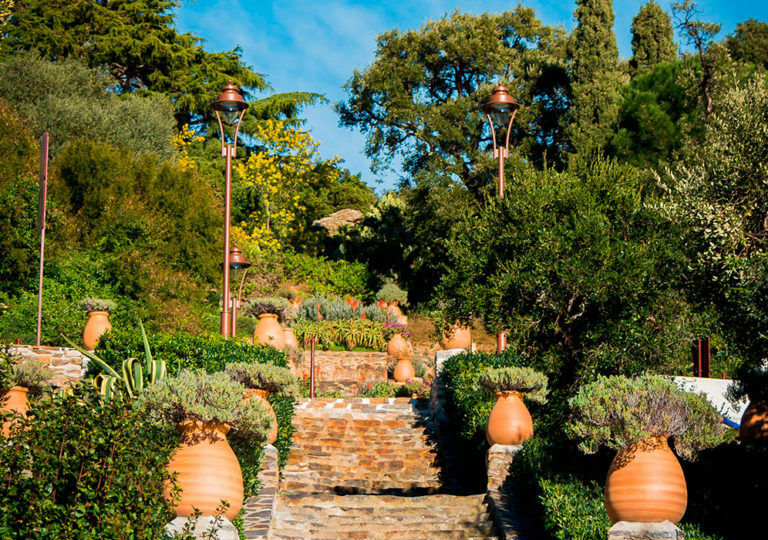 The notoriety of the resort is intimately connected to that of the “Jardin des Méditerranées”; its Renoir-like landscapes are amongst the Côte d’Azur’s most beautiful. 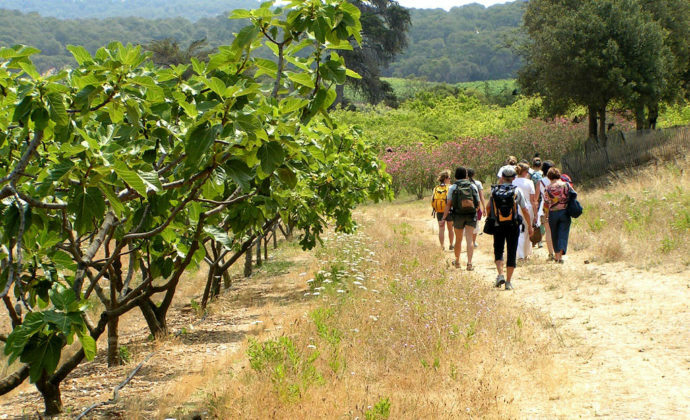 For the space of this walk, one gets the impression of travelling through the 5 continents, or at least to the places where the vegetation enjoys a Mediterranean climate: from the acacias of Australia to the agaves of Mexico, the bambous of Asia to the linen of New Zealand, the palm trees of Chile to the carob trees of the Mediterranean. 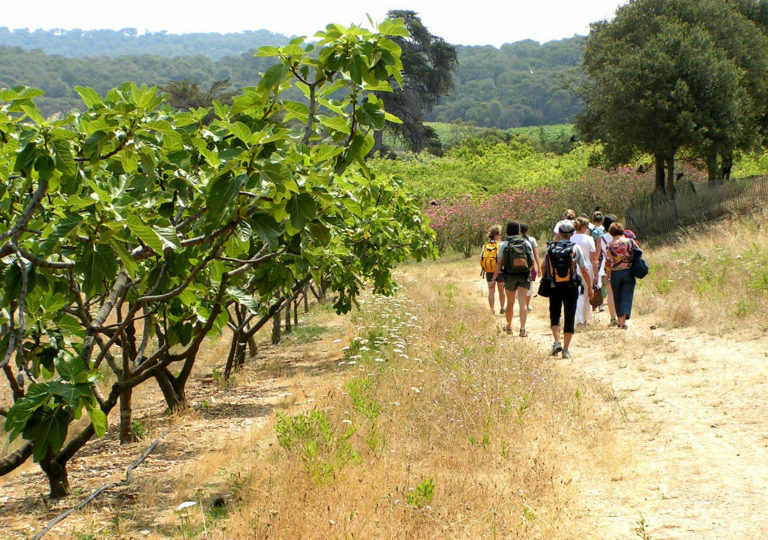 There are several activities and creative workshops on offer to accompany the visit:LThe incredible Domaine du Rayol. 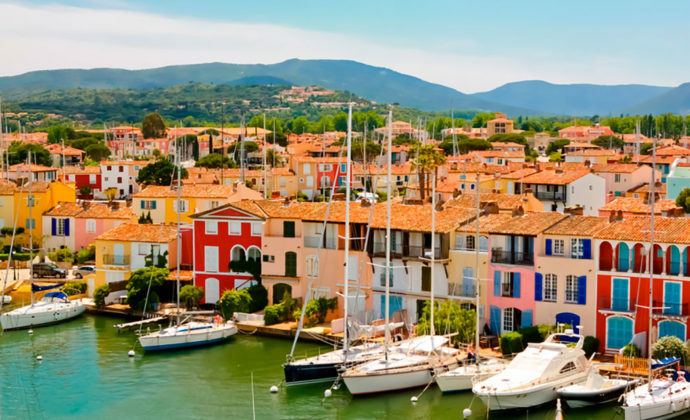 There are many small Provençal villages on the Gulf of Saint Tropez and in the hinterland. We have selected our favourites. 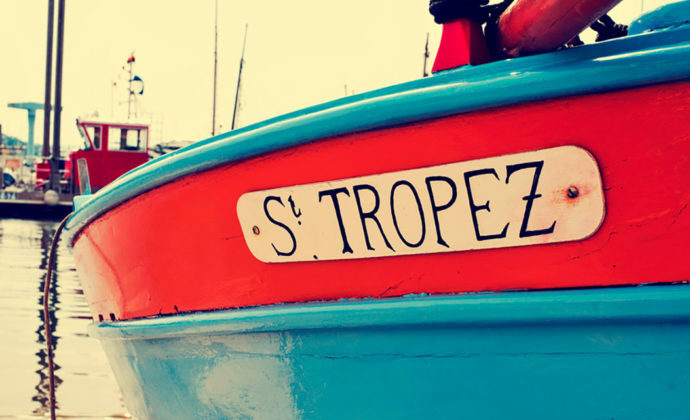 Saint Tropez is only 15.5 miles from La Villa Douce and is well worth a day trip. Walking along the port, one finds oneself dreaming of Françoise Sagan, Eddie Barclay or Brigitte Bardot who have each in their own way left their mark on the place. And for those nostalgic for Louis de Funès, do go and visit the Gendarmerie et Cinema museum, a symbolic place that hosted the Saint Tropez brigade. Gassin is a medieval village nestled in the middle of the vineyards, that belongs to the very exclusive “Most Beautiful Villages of France” club. 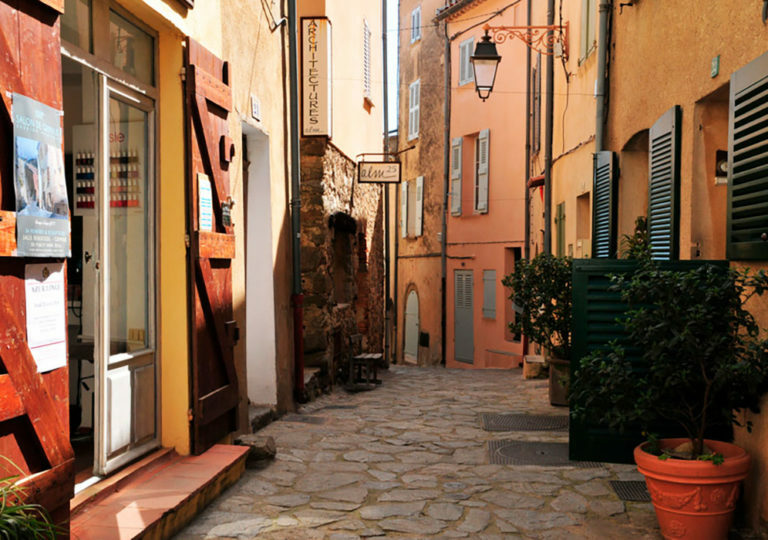 Take advantage of this opportunity to taste one of its very good Côtes de Provence on its shady square, before continuing the day with the discovery of Grimaud, located a little farther north. 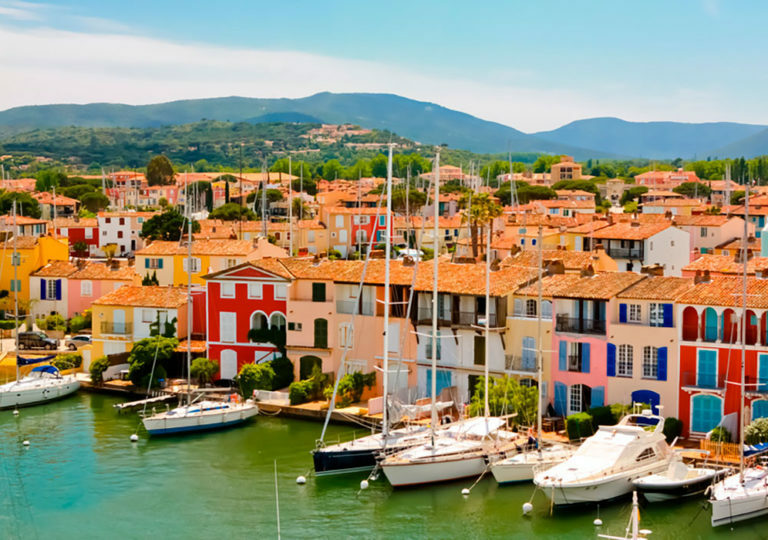 Also a medieval village, from the foothills of the Maures Massif, in the middle of oak and chestnut tree forests, it overlooks the Gulf of Saint Tropez. 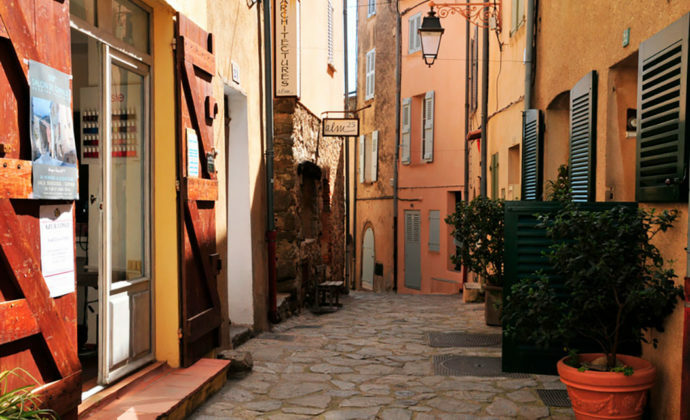 Referenced amongst the Var’s most beautiful spots, the medieval village of Bormes-les-Mimosas constitutes an essential discovery stop for lovers of old stones and history enthusiasts. 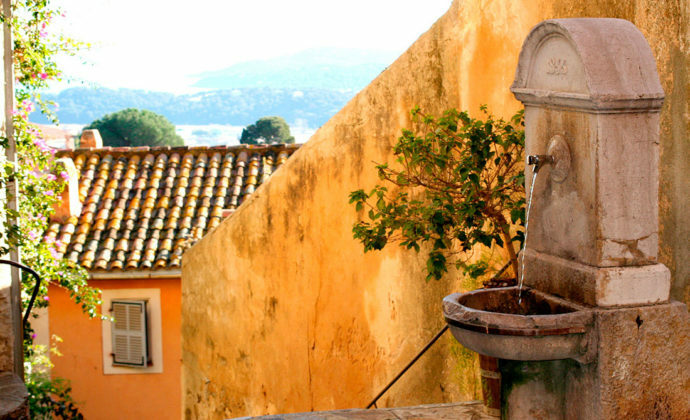 All the same, let us locate “Poulid Cantoun” square as it would be a pity to miss this must-see place in Bormes. 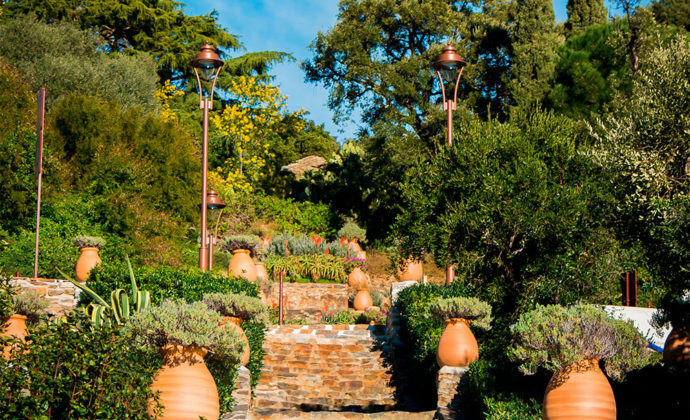 The stone constructions harmoniously match the amazing profusion of plants: bougainvilleas, giant rubber, tree ferns and century-old pepper plant. 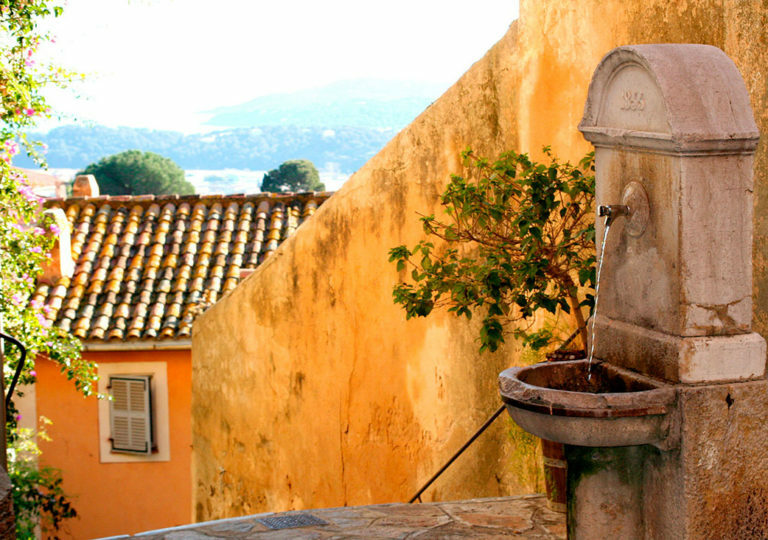 Ramatuelle is a small, very picturesque medieval village, with its ramparts, its pink roof tiles and narrow lanes. From the shade of its café terraces, one enjoys a sumptuous panorama over Pampelonne bay. 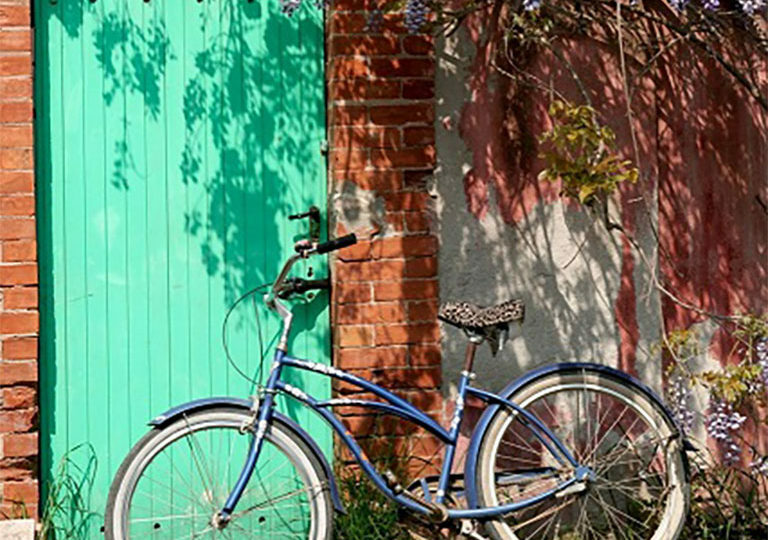 Every Thursday and Sunday, the Provençal market brings the village to life, and it is lovely to wander about here and sample this atmosphere peculiar to Provence whilst savouring a few specialties in passing. Down below, a totally different atmosphere reigns on the beach, a Mecca for the jet set community. 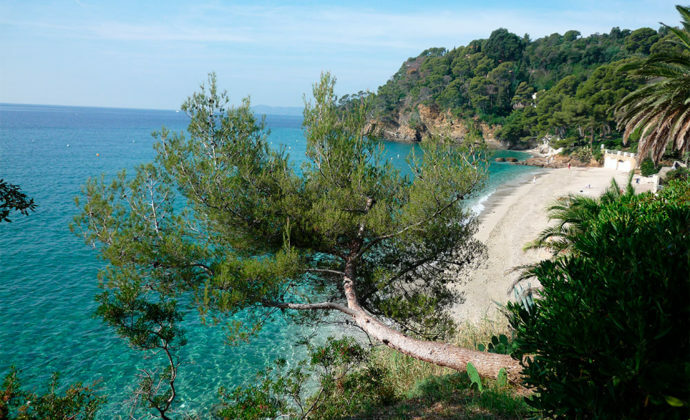 We gaze at them on the horizon from La Villa Douce's terrace: Porquerolles, Port-Cros and Le Levant Island beckon us out to sea, for the space of a day. 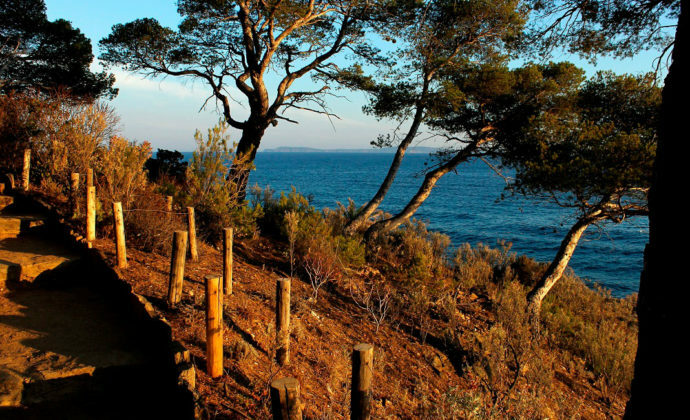 If one likes hiking, one generally prefers this island classified as Port Cros National Park, Hyères’s most wild and most mountainous. It is also a paradise for divers. 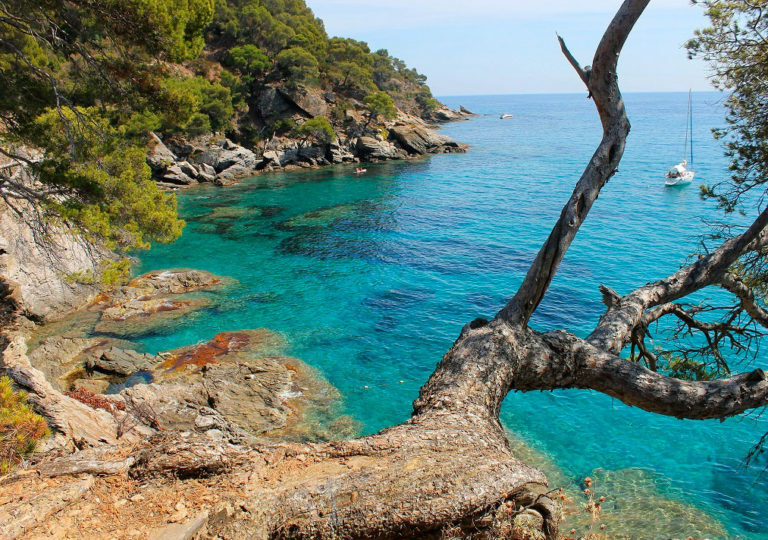 Escape to this unspoilt island to take advantage of the its fabulous viewpoints and clear waters. Known for being a naturist island since 1931 (first naturist domain in Europe), the Levant also welcomes those who prefer to remain dressed and they would be wrong to stay away. It is a haven of peace, a unique balcony on the Mediterranean. 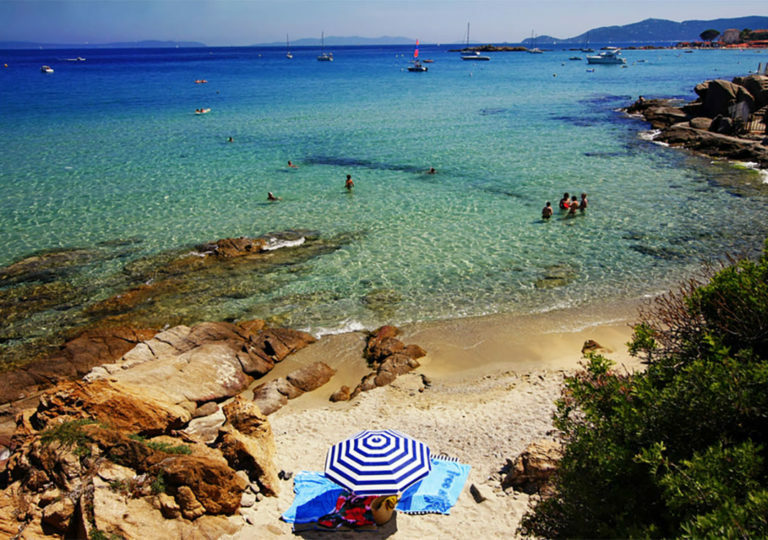 Named the “Gem” of the Hyères islands, Porquerolles, with its paradisiacal large fine sandy beaches, is the biggest and most well-known. one happily discovers its way-marked footpaths on foot, but especially by bicycle, in order to go up and down the length and breath of the island. 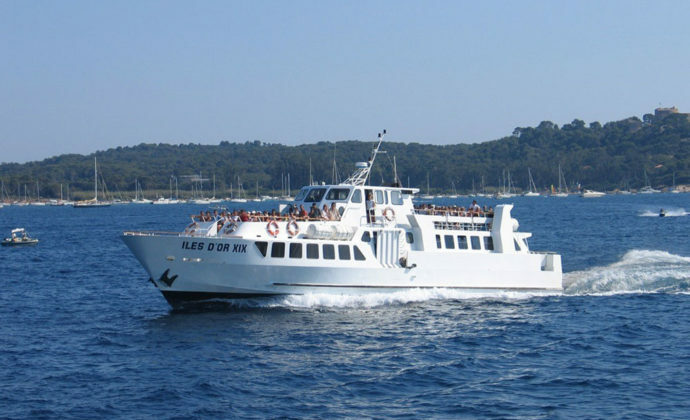 The Îles d’Or and Corsaire launches cast off all year round from Lavandou and Cavalaire for Port-Cros and the Levant, and from April to September for Porquerolles. 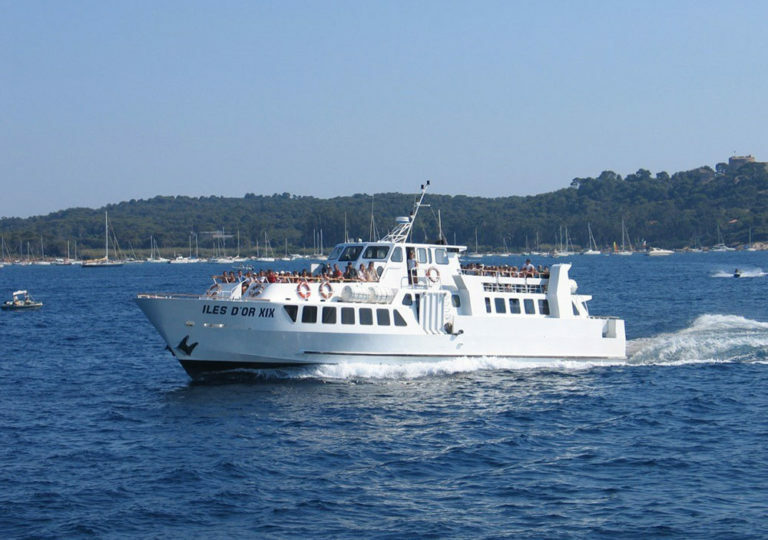 The Croisière Bleue® proposes an exceptional day spent between land and sea as part of a guided coastal cruise with a free call at Port-Cros and Porquerolles. La Villa Douce’s reception handles our booking and gives us a discount!